For those of you who haven’t picked up Bonded, Book One of the ShadowLight Saga, it’s on sale for 99 cents, along with fourteen awesome young adult paranormal bestsellers, from February 12th through the 15th. The YA Bookshelf is hosting this special Valentine’s Day event. 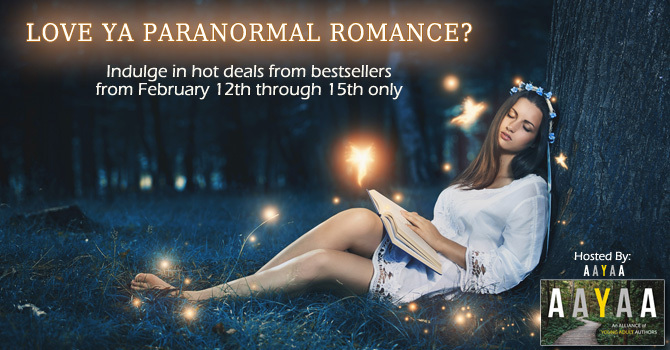 Click Here for a blurb of each on-sale bestseller if you’re in the mood for a little chill-inducing, heart-palpitating, paranormal snuggle-up. For those of you who are wondering what in the world happened to new releases? Big shifts happened this last year. I’ll be talking about them on my blog soon, but for now, know that in about one month, I’ll be back on track and as determined as ever to get stories out to my very patient readers. I can’t tell you how much I appreciate your continued support through this rough spot. Also, this year, I’m thinking up some unique giveaways. Let me know what you’d like to see for this coming year in the comments section below. I’m all ears (not literally – as I’m conjuring up a giant typing ear in my somewhat cracked mind’s eye), and raring to go!